In 2014, New Mexico led all U.S. states in percentage growth of exports to Mexico with 93% increase. The next highest state was Montana, which saw its exports to Mexico grow by 66%. Total state exports to Mexico climbed from $802 million in 2013 to $1.549 billion in 2014 (see category breakdown below). Mexico is New Mexico’s number one export market, accounting for 41% of state exports, followed by Israel at 21%, Italy at 7%, Canada at 6% and both China and Ireland at 3%. Previously, the U.S. Department of Commerce has estimated that more than one-half of the state’s exports to Mexico originate in southern Dona Ana County. 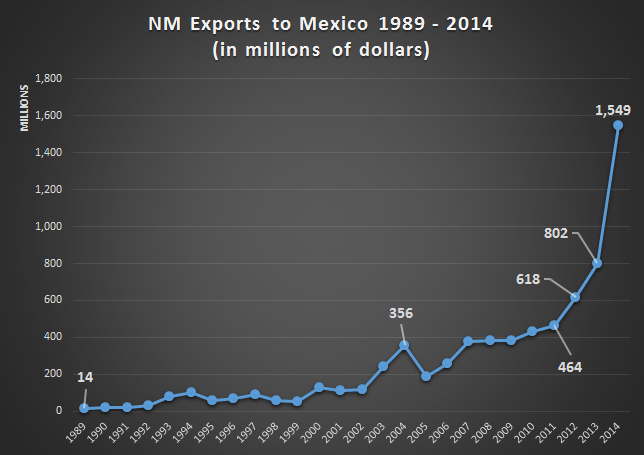 New Mexico’s exports to the world rose 39% in 2014 to a total of $789 billion.